Checking my form today I noticed that it is not working properly in any version of Internet Explorer. This includes IE11 and below. The form keeps throwing errors stating 'JotForm' is undefined. Even previewing the forms on the Jotform site throws errors when using Internet Explorer. 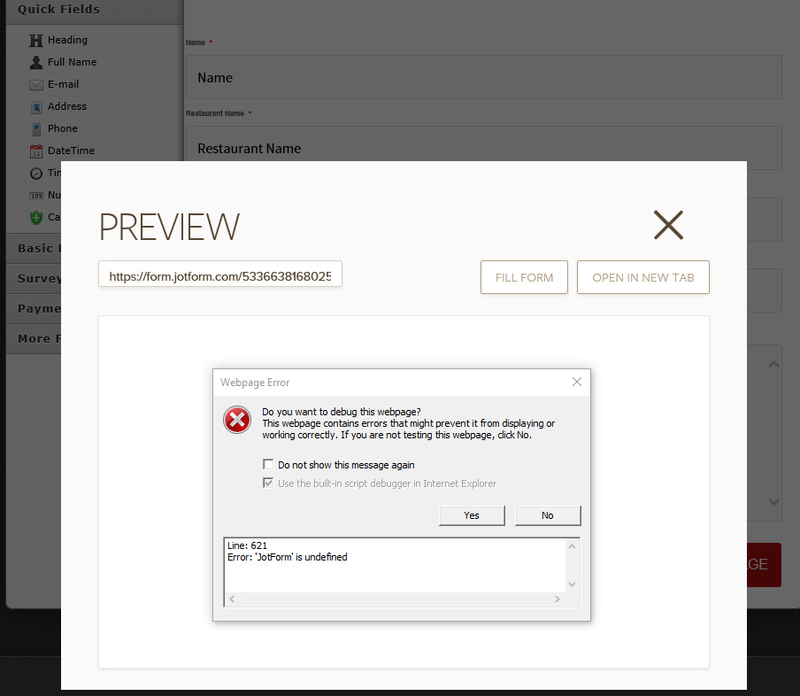 I have attached a screenshot displaying the error when previewing my form. Is this an issue that needs to be addressed on JotForms end and is there any timeframe for a fix? There is currently a temporary issue with form JS based features in Internet Explorer 11. We have already escalated it to our Development Team, and expect this issue to be fixed within hours. We will let you know once the issue is completely fixed. The issue has been fixed by our developers. Your form should work properly in Internet Explorer 11 and other browsers. The issue appears to be resolved. Thank you for your prompt reply and attention to this matter.